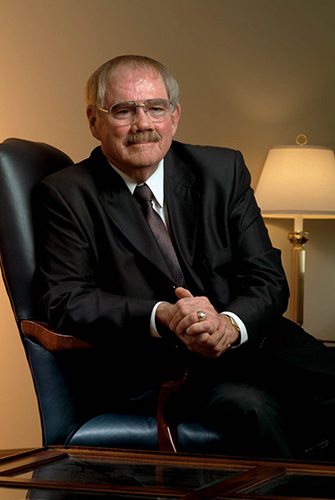 Jim McBride's '62 planned IRA gift will endow eight, four-year General Rudder scholarships for students in the Corps of Cadets. Jim McBride's '62 planned IRA gift first will endow eight, four-year General Rudder scholarships for students in the Corps of Cadets. McBride's gift will also provide for the Corps of Cadets Center with the remainder benefiting The Association of Former Students. He found that the gift was very easy to structure, by simply changing the beneficiary of his IRA to the Texas A&M Foundation. Jim: In the late 1960s, I located my local Aggie classmates and arranged a quarterly lunch with them at a Dallas area restaurant. Over the years, we've built this thing from six guys having lunch to 27 guys. It's a lot of fun. We're all now in our mid-60s, and it seems like we were just youngsters the other day. Where did those 40 years go? You just hit a point in your life when you need to take care of the ultimate distribution of your estate. My estate is going back to my roots - to A&M. I'd like for my buddies to learn more about supporting A&M in their estate plans. It's a gradual thing, an educational process. When I was at A&M, too many of my friends - excellent students and great guys – had to leave school because they just couldn't afford to continue their education. It was a shame to see them forced to leave school. That bothered me then in 1958, and it bothers me to this day. Hopefully, my gift will help kids get through school. I wouldn't think of any other place in the world to go to school. It gave me so much - self discipline, lifetime friendships, a sense of teamwork. I wouldn't take a million dollars for the experience. When you look back, it's the best four years you'll ever spend in your life, and I'm going to give many Aggies an opportunity to have that life-changing experience in the future.